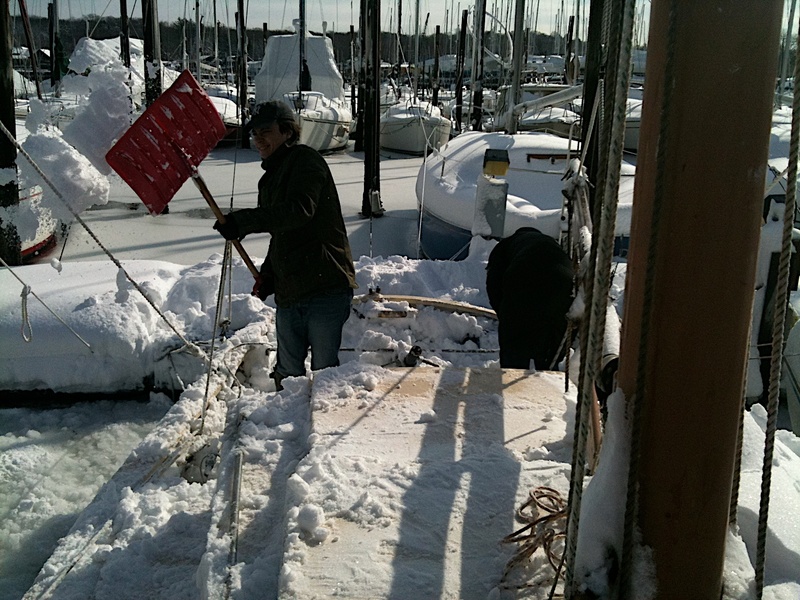 Last winter was the first time I had to deal with a boat (no less a wooden boat) in wet storage. I only reached Huntington on November 24th, so I didn't have much time to prepare for the onslaught of the Winter of 2010 -- the year the word 'Snowmageddon' was coined. I blogged about it at the time, and vowed to make a winter cover for this year, to avoid having to shovel the poor Blue Moon, as we did -- seemingly on a weekly basis -- last year. The plan was to use my mom's old sewing machine to make one of those lush, full-length covers you see on some boats. However, after pricing the amount of Sunbrella I'd need, and assessing all the work involved (sewing is NOT my favorite craft), I decided to try something a bit simpler. 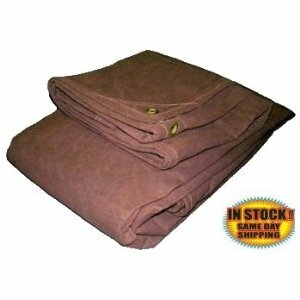 I found a supplier of American-made, 18oz, treated canvas and purchased a 12x12 and 8x10 tarp from Amazon. The quality of the American Canvas tarp is really outstanding, I must say. The canvas itself is thick, heavy, and treated with something or other to make it water resistant. The seams are well sewn, and the brass grommets are heavily reinforced. It's weight, I thought, would prevent it from flogging itself to death, as I've seen happen with lighter material in heavy winds. And we do get some heavy winds here, in winter. The tarps were both long enough so that I could fasten the edges to the rail. However, when it came time to install the tarps, I didn't like the idea of screwing 6 eye straps (each side) into the Blue Moon's rail. First, I didn't think they would look very good, unless I could find nice bronze ones, perhaps. Second, they would be murder on the topsides of any boat we rafted up to. I'd also have to de-rig my running backstays, but that wouldn't be too much bother. So, as a trial, I decided to tie the tarp down inside the rail. There were plenty of places to tie it down inside. 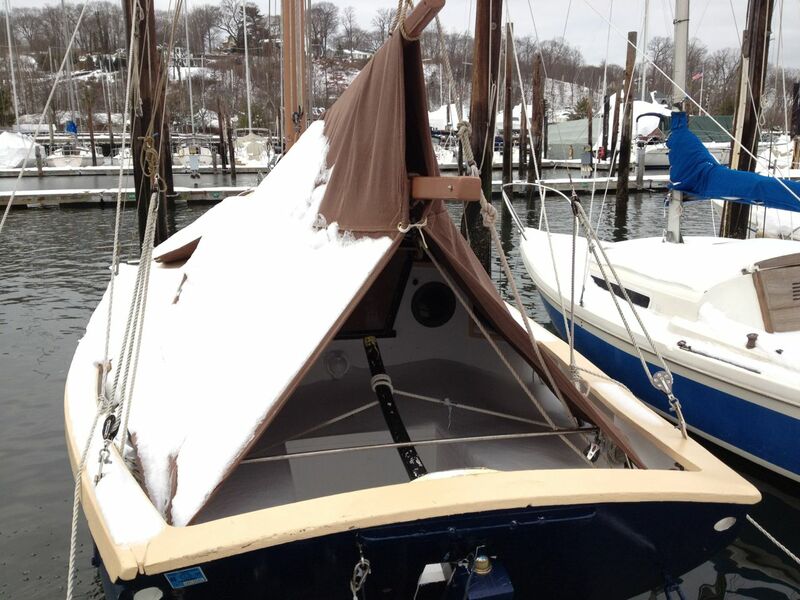 For ribs, to hold the tarp up and out under snow load, I decided to use a trick recommended on the Wooden Boat Forum, which is to use PVC pipe. I forgot to take any pictures of this, but you can see the one test 'rib' in the photo below. I wasn't sure what size pipe to use, so I started with just one 1" rib. If it works, I'll add more later. So, after trying various configurations of the tarps, I ended up with Configuration #1, below. I wasn't 100% happy with it. Ideally I'd like to close that gap in the middle between the two tarps, but this arrangement gave good coverage for both the cockpit and the anchor well in the bow. I decided to give it a try for the first snow. Another problem, obviously, is the opening at the back. However the bow is pointing to the west and our prevailing winds are from the southwest, so I was hoping this opening would not let too much snow in. Oh, the bliss of ignorance! This week, in mid January, we finally had our first snow, about 2 inches. Quite a difference from last year, and I'm not complaining. For the most part, the snow is on the tarp, rather than on my paint, so that is a success... Here in the east, the snow is quite dirty. It looks white, but in reality, there is a lot of grit and grime embedded in the snow. When it melts, it leaves behind a dirty residue. The primary goal of the tarps is to keep the sun and grime off my poor paint. In this regard, I'll give it a grade of Not Bad. However, there certainly would have been more snow in the cockpit without the cover, so I'll have to also give this a Not Bad grade. Less successful was the PVC rib or batten. The 1" pipe just wasn't strong enough, I guess. put something over the opening at the stern... probably one of my small, home-made tarps. I'm still not keen on putting eye straps on the rail... that will have to wait to Configuration #3, at least. If you have any clever ideas to share, particularly about how to hold the edges of the tarp down to the rail without a bunch of eye pads, I'd love to hear them. 1/why not pass several lines under the boat & tie it down? Don: I considered passing lines under the boat, but because of the shape of the hull, the lines would chafe on both the topsides, at the turn of the bilge, and of course on the keel. The keel is solid lead, so I don't think the lines would hurt it, but I also doubt that the lines would last a whole season without chafing through. Your second suggestion is interesting, though. I will have to give that some thought. 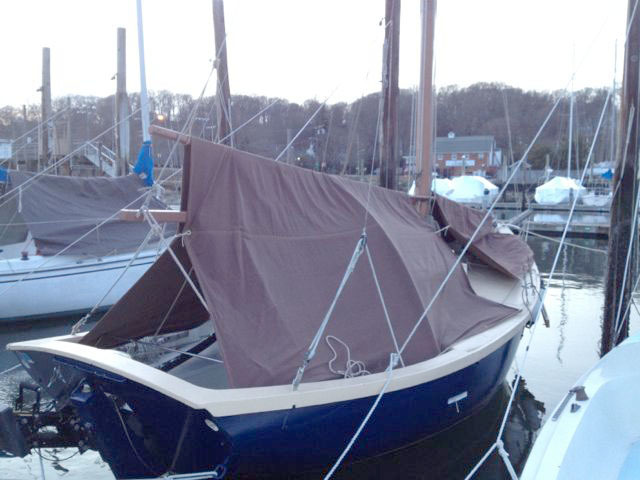 Why not actually sew the two tarps together and add some additional fabric at the stern with a zipper so you can get in and out? This way you're letting the tarp company do all of the tabling (which is the boring part of canvas work, and you can do the fidly bits of making things fit). it looks to me like you may need one more small tarp. You really want the forward part to slip over the bow, and then you can use the extra to bridge between the tow and go around the mast. I love the idea of taking something commercially made, like this tarps, and modifying them for a specific custom use. You get the Couture for the mass produced price, with just a little extra work. For tie downs, why not just hang some sand bags over the rails? 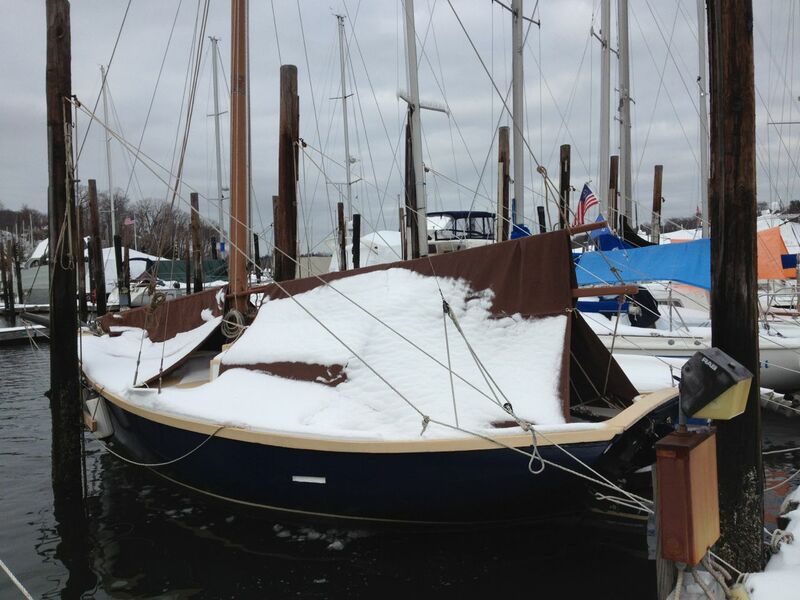 keeps the thing taut, and the snow runs completely out of the boat, with no drilling. you just need to have the cover attached at the centerline so it doesn't slide one way or the other. To get around any of the running or standing rigging, you just need to make a slit in the tarp with a fastener on the other side. 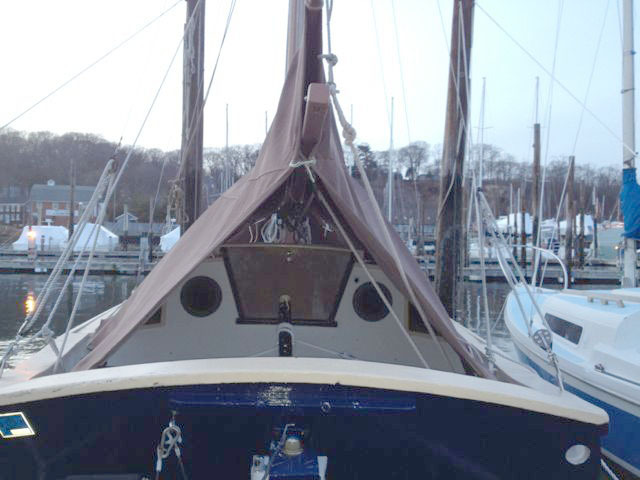 we have mast up covers on the Lido 14, that go around the mast and shrouds. Easy peasy. just put some leather around the opening to keep it from chafing. Steve: a lot of great ideas in your post. I've thought of sandbags, but have never actually seen them in use. Your photo is an excellent illustration. Yes, the finished tarps I bought are probably 1/3rd the price of the material alone, in 'marine grade' Sunbrella. Just need to get them to fit, nicely. Instead of sewing the two tarps together, I'm thinking of putting in more grommets and then lacing them together, with a line. That should be good enough, make the heavy tarps a bit easy to manage, and allow me to use one of them for a summer awning. If I cut the smaller one to fit the bow better, there will be a lot of extra canvas to use for the open triangle in the stern. Nice use of a canvas tarp to keep the show off your boat. I'm sure it wasn't very fun to clean all the snow off in the first place. In the first picture, it looks like the water has ice on it. 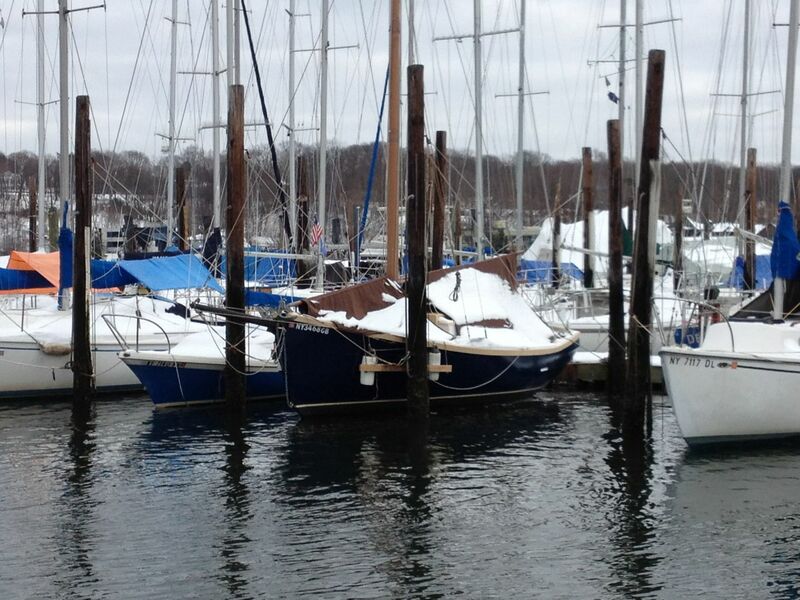 How does that affect your ability to use the boat during the winter? And if you don't use it, wouldn't dry storage just be better?